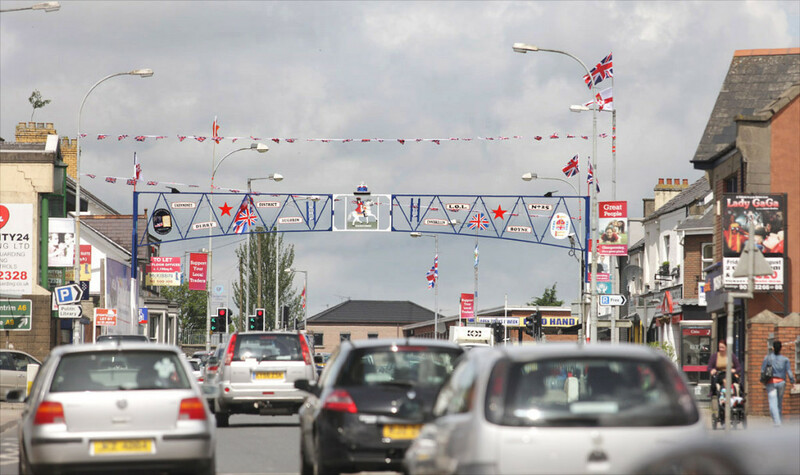 Unionist flags across the city outnumber nationalist flags by 13 to one, a new report by Queen’s University academics has revealed. The statistic was one of a number of findings by a report which sets out a three-year plan for flying of flags in public spaces in the north. The report suggests that unofficial flags should only be erected with community consent and only remain in place – for example on lampposts – for two weeks and only to mark significant dates. Flags: Towards a New Understanding was co-authored by Dr Dominic Bryan and Dr Paul Nolan from the university’s Institute of Irish Studies and is based on a study involving a survey of 1,421 residents across Northern Ireland’s 11 council areas, work with focus groups, and interviews with political and community representatives, alongside a review of current policies. 70 per cent of people felt the issue of flags on public buildings was either important or very important, with just 18 per cent saying it wasn’t important. Seven out of 10 people polled want to see more regulation of flags in public spaces. 53 per cent of people support the flying of flags on council buildings on 18 designated days. The report, which aims to inform a new panel set to be established next month under the Fresh Start deal, favours a ban on all paramilitary flags and recommends that all councils should fly the union flag on 18 days a year. The report also includes thedocument ‘Liberty and Respect: Guidelines for the Unofficial Display of Flags in Outdoor Settings’ which its authors hope will inform the evolution of a new consensual approach to the flags problem. Co-author Dr Dominic Bryan described the flying of flags on lampposts as a “complex problem”. “While new legislation would make it easier for agencies to act, there are real issues about the likely level of compliance and the resources required,” he said. “Also, due to links to bonfires, murals, kerb-painting and other forms of cultural expression, any legislation aimed solely at flags would achieve little on its own.